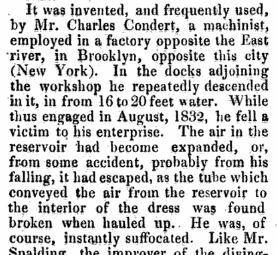 Charles Condert made many dives in the East River around Brooklyn using his scuba until one day of August 1832. His body was hauled back to the surface, Condert had died using his scuba set. He became the first documented diver to die using a self-contained underwater breathing apparatus. Further development on his invention came to a halt with this tragic event.